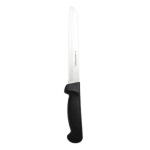 "This is a great bread knife for everyday use. It's inexpensive, so you don't worry about it getting beaten up - just buy a new one when one give..."
"This is a great bread knife for everyday use. It's inexpensive, so you don't worry about it getting beaten up - just buy a new one when one gives out. It's sharp enough to cut through a variety of loaves of bread, and it stays sharp for a long time."